Having decided she wanted to be a geologist as soon as she learned what that meant, Emily has been collecting rocks and constructing geological stories for as long as she can remember. Since graduating from her bachelor's program in 2008 from the University of Alberta she's been busy in the Yukon and British Columbia working on various mineral deposits ranging from polymetallic veining to orogenic gold to porphyry deposits. As someone who loves solving geological puzzles and reconstructing the stories behind observed structural configurations, she is particularly pleased when she gets the opportunity to untangle complicated geological puzzles. 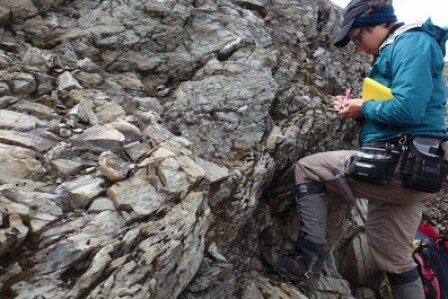 For the past six years the porphyry-rich Stikine and Quesnel Terranes have been her geologic home and while she's had fun and learned much, this work has resulted in many questions that she hasn't had the opportunity to address due to the practicalities of working for junior exploration companies. Therefore, she leapt at the opportunity to take on a master's Project with Lori Kennedy at the University of British Columbia, unravelling some of the puzzles surrounding the structural environment of Jurassic porphyry development in the Stewart District of the Stikine, while gaining a structural geologist's expertise to apply to solving geological puzzles related to mineral deposit formation well into the future. Project: District-wide geodynamic controls on porphyry and epithermal-style mineralization in the Stewart area (northwestern British Columbia): The role of reactivated basement structures. Most porphyry Cu-Au deposits are generated in volcanic arc environments under broadly contractional stress regimes marked by crustal thickening, surface uplift and rapid exhumation (Sillitoe, 2010). The 170 km-long mineralised Stewart District in northwest BC is host to the Early Jurassic Kerr-Sulphurets–Mitchell Cu-Au deposits, the Brucejack epithermal gold deposit, and numerous other porphyry and epithermal deposits. The district has experienced significant Cretaceous contractional deformation that obscures the original structural and depositional setting in which these mineral deposits formed. Recent detailed studies suggest that the supergiant Cu-Au Mitchell-Snowfield deposit was emplaced in an Early Jurassic, fault-bounded, pull-apart basin (Febbo, 2016), rather than in a contractional environment. Nelson and Kyba (2014) initially proposed that fault-bounded Jurassic basins were subsequently reactivated (inverted) as thrust/reverse and tear faults during mid-Cretaceous contraction. If this model is correct and is applicable on a regional scale, the recognition of this environment of porphyry formation will lead to the development of new exploration models for porphyry mineralisation both within the Canadian Cordillera and globally. In order to test this model, and its applicability to the region as a whole, this project will be focused on structural and stratigraphic mapping of two sites, the Big Bulk Au-Cu porphyry, and the Red Mountain Au epithermal deposits, which are along strike and to the south of the better studied Sulphurets district deposits. The goal of the project is to define the Early Jurassic basin geometry, structural architecture and stress regime that are associated with the deposits in the mapped region. It will assess whether the intrusives were emplaced along syn-sedimentary growth faults and will address the mechanisms of formation of permeable pathways for magmatic and hydrothermal fluids. It will be focused on developing and comparing deposit-scale models of the structural regime of the Early Jurassic at these sites, and its control on mineral deposit formation.